Me and Ron Garney. Ultimate Captain America. 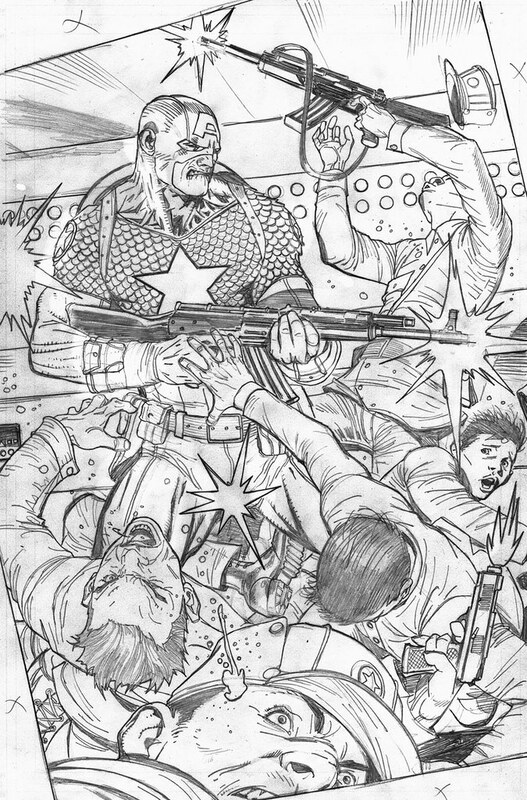 Four issues of super soldiers punching each other in the face. February. Posted by Jason Aaron 0 comments Labels: WHERE THE HELL AM I? Latest installment of my CBR column is now online, featuring a bit of pre-con advice on how to woo the editor of your dreams. See you all in New York. Where you find me, you will likely find SCALPED artist R.M. Guera as well. It's Guera's first ever trip to an American convention, so please try and make him feel welcome. Also, we will likely be drunk on Serbian bathtub wine, so be warned. Pie in the face, originally uploaded by Jason Aaron. First I shaved this guy's head. Then I hit him in the face with a pie. Then I proceeded to win a poker tournament. Now that's what I call a comic book signing.